Contents and Media: Seven parts in grey coloured resin; markings for one aircraft. 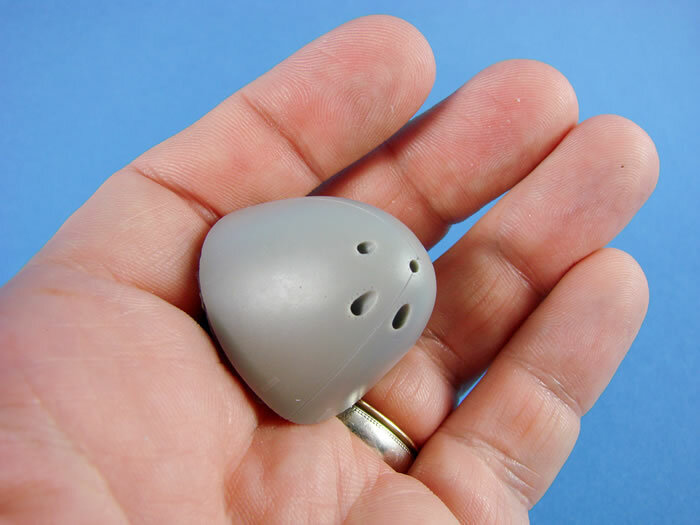 Advantages: Great detail and casting; a simple and interesting conversion. Recommendation: a very simple and effective conversion that completely alters the appearance of the glazed nose bomber and turns it into the more menacing-looking heavy fighter version. Junkers’ Ju 88 design was perhaps one of the first, true multirole aircraft, in every sense of the word, and the basic airframe was developed, added to and converted into roles ranging from fast-bomber, through to anti-shipping, night fighter, reconnaissance, heavy fighter, and also unpiloted flying bomb. The initial C version was converted from Ju 88A-1 airframes into a heavy fighter/fighter bomber role and dispensed with the usual glazed nose in favour of a solid metal nose through which four guns protruded. The gondola also had a solid front instead of the glazed area. The C version was pretty much the genesis for the later G-series machines we saw, albeit the C still had the Jumo engines and not the BMW radials. 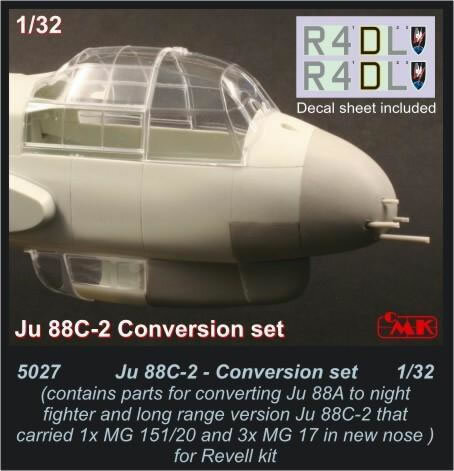 CMK’s little conversion set is simplicity itself and enables you to convert the Revell/Promodeller Ju 88A-1 into the rather slick looking heavy fighter version. There are external differences between the C-2 and C-4 machines, including the rear canopy. With the C-2 being converted from the A-1, there was only a single MG in the rear cockpit, whereas the C-4 had double rear-firing MGs, being converted from the A-5. To that extent, it’s possible that you could build the C-4 if you used the Ju 88A-4 kit. My eventual project will be to create a Ju 88C-0, for which there were only a handful converted. In a dusty corner of my attic, I have a complete starboard, forward window frame from a C-0 that crash-landed in Norway due to engine failure. To build that is on my modelling bucket list. Anyway, I digress. 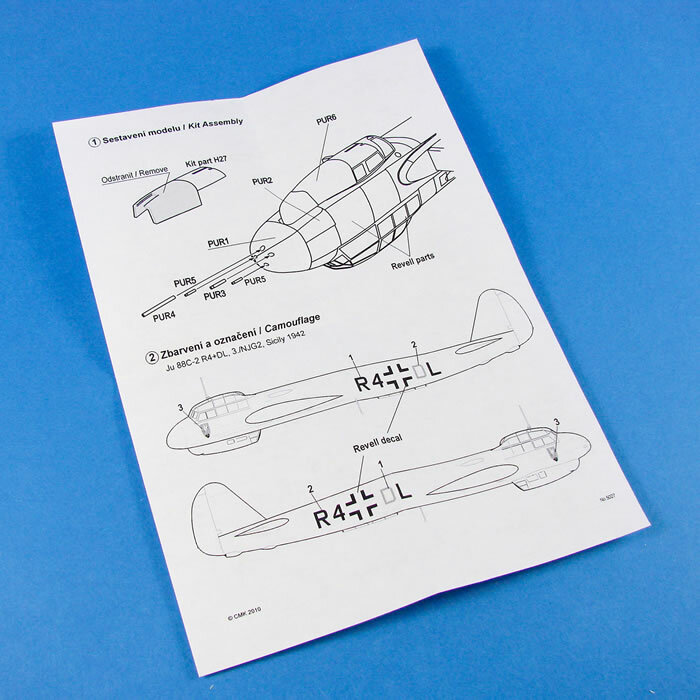 CMK’s Ju 88C-2 conversion set is packaged into one of their small and standard yellow boxes with a top-opening flap. A sticker label is attached to the front, showing a photo of a converted nose. Inside the box, a small zip-lock bag contains three main resin parts, plus a casting block with a further four components. A small instruction sheet is included, as is a very small decal sheet. 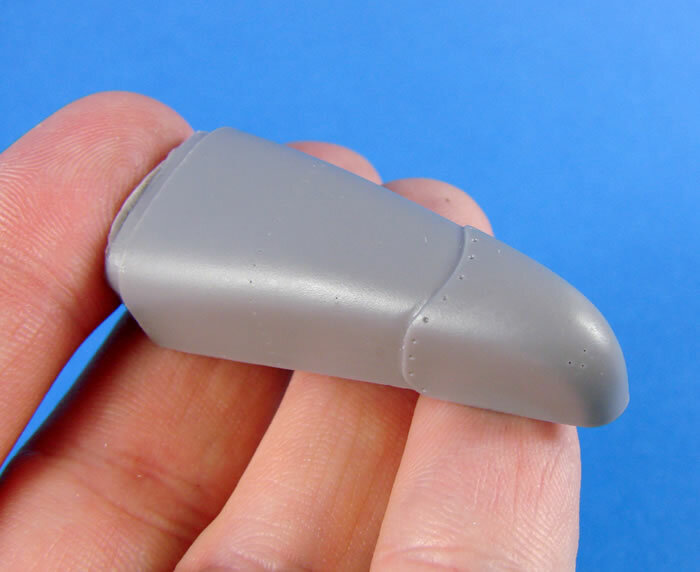 All parts are cast in light grey resin, and the quality of them is excellent, with no flaws or other issues evident. You will of course need to remove casting blocks, or in the case of the new nose, grind down the pouring stuff so that just a small ridge remains that can help with location to the host model. The new nose is a solid piece, which is just fine as there was a metal sheet that divided the cockpit from the nose interior, with just the gun barrels protruding through. External detail is commensurate with that of the host kit, with fine panel lines. A number of latches line the circumference and the muzzle tubes have very fine riveting around them. Underneath the nose will sit a new section that does away with the glazed area of the kit and is located directly next to the new nose. As with the nose section, this is resplendent in fine panel lines, plus some fastener details. The replacement forward gondola is cast as a solid piece with a pouring stub that will need removing. Thankfully, the underside of this is profiled to fit the fuselage. I’ve seen a couple of builds where a little filler has been needed, but nothing too onerous. Detail here consists of a forward fairing that is riveted to the gondola body. Nothing else is needed, unless, like me, you intend on riveting the entire airframe. 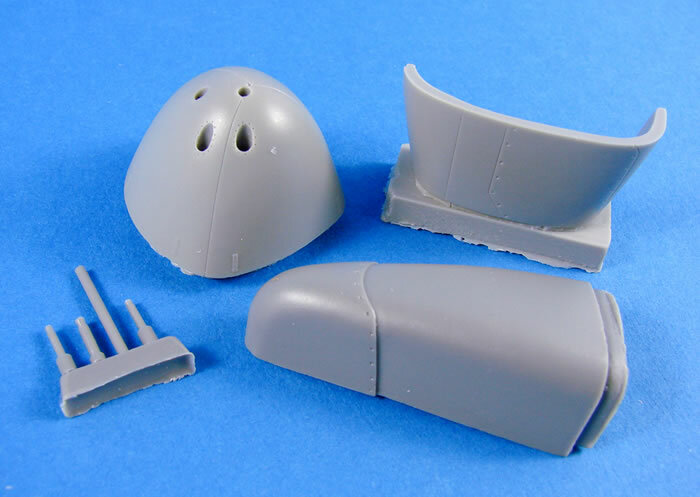 A little surgery will be needed on the original kit gondola so that you can graft the new section. Four barrels and muzzles are supplied, with hollow-cast ends. These are cast on a single block. I would perhaps try to hollow the muzzles out a little further with some very small drill bits, but a touch of wash in the ends would probably give a good illusion of depth. 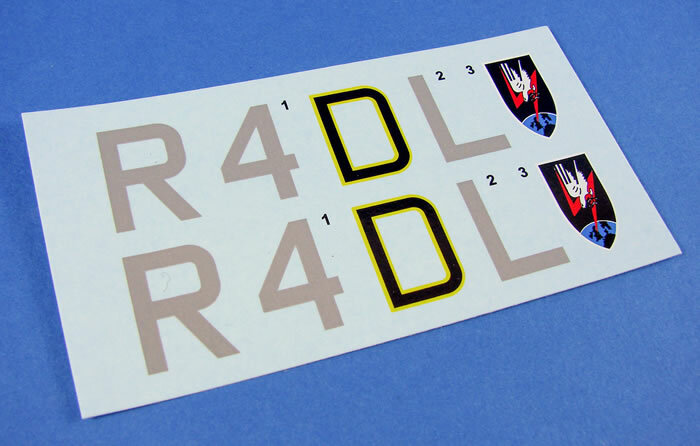 A small decal sheet is supplied that contains just the fuselage codes and unit badge. Printing is super-thin and has minimal carrier film. Colours are solid, and registration is perfect. I’m unsure as to what style of national markings you would need for this, but you may have to research that yourself and provide them too. The instructions do say that you use the Revell decals, but the Balkenkreuz is depicted as an outline version. Instructions are delivered on a double-sided piece of A5 paper, with one side depicting the parts in the set, and the reverse side showing the conversion and decal placement. Illustration is simple line drawing. No colour codes are given for anything, so reference is essential. As I’ve said, a very simple and effective conversion that completely alters the appearance of the glazed nose bomber and turns it into the more menacing-looking heavy fighter version. Conversion itself looks to be a breeze and nothing here should be too difficult even for the newcomer to resin. Maybe a good first conversion project? Thanks to MPM / Special Hobby for the review sample.